It is rather easy to enjoy a better experience with vaping. All that is required is a few minor tweaks and you are on your way to a better experience. These are the things that a user of e-cig should do. However, they do not do so. This is either because they are unaware of it or they do not take the time to do it. Your journey to a better experience starts on the very day you receive your electronic cigarette kit. Make sure that the batteries are charged fully before you start using it. Unless the instrument is charged properly, it will not function to the best of its capacity. It is also possible for the battery to get damaged permanently. A full charge is critical on the first day. However, you should still give the battery a full charge every once in a while to maintain its performance. Draining the battery before a full charge improves its longevity. You may feel the need to change or clean the battery once every day at least. Make sure you do it properly. You need a paper towel as well as the e-liquid you want to use. First, remove the cartomizer. Look at the e-cig threading and check if any e-liquid residue is left. Residue does tend to accumulate after a time. Take the paper towel and fold it up to create a narrow triangle. Insert the edges of this paper towel into the residue laden areas to soak it up. You must never use soaps or cleaners for this purpose. The residues left behind by either can completely ruin the vaping experience. You must take care never to mix two different e-liquids. Doing so can completely ruin the flavour. It may turn out to be too strong or too weak. One flavour may end up overpowering the other. Additionally, the different chemicals can react with each other leading to an unpleasant experience. You may want to save money by purchasing cheaper e-liquids. Apart from the fact that such products are of a very poor quality, they might not be completely safe in the long run. It is quite possible for these products to contain harmful chemicals. Extract the cartomizer from the e-cig battery. 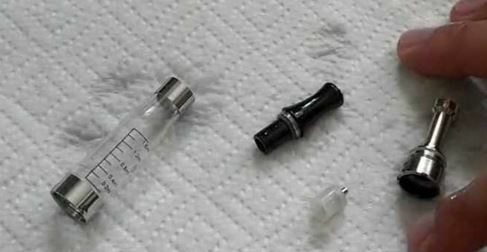 Remove the mouthpiece as well as the white rubber ring. You can use small tipped tweezers for the purpose. Take a needle syringe and fill it up with hot water. Gently, stick the needle of the syringe into the back of the cartomizer. Through the cartomizer, pass a bit of water. Holding the filling tip of the cartomizer, fill it up with hot water. Allow the water to loosen up the residue and grime. Repeat the process after a few minutes. Stick the needle through the front opening and gently scrape off any residue around the threads. Pass some more water via the backside. Repeat the process as many times as required till all residues are eliminated. You can use the syringe to get rid of all water.